Posted by Eddie & filed under Military/Aircraft, Mountains & hills, June 5 2009. Two weeks ago I went for a walk in the Mounth area and my route (the first 5km of which I cycled) took me along Jock’s road in Glen Callater and across the Munro summits of Tolmount and Carn an t-Sagairt Mor. On the walk there were two sites of air crash wreckage; the first was of a Fairey Swordfish, a biplane that was used by the Royal Navy in the Second World War, but the date of this particular crash is unknown. The site lies at an altitude of 730m, at the head of Glen Callater about 1 km west of the summit of Tolmount in the Mounth hills. The site consists of a pile of rusted pieces of the airframe, with all of the canvas construction of the Swordfish having disappeared over the years. The wreckage is in one location, hidden amongst rocks on steep ground. You can see photos of this site on my website here. The second site I visited is perhaps the most spectacular air wreck site in the Scottish mountains. 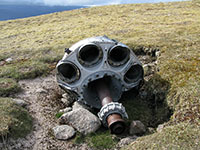 An RAF Canberra jet crashed on the summit of Carn an t-Sagairt Mor in 1956, and a very large amount of the wreckage still lies scattered around the summit area. The debris field covers an area of about 600m by 600m, centred on the flat 1047m summit of Carn an t-Sagairt Mor, with large pieces to the north, west and east of the summit, some lying in boulderfields away from the main walking paths, down to an altitude of about 960m. Remains of all three of the Canberra’s main wheels are still at the site, including one that is standing upright and in excellent condition – this is perhaps one of the most unusual pieces of air wreckage of all the crash sites in the Scottish mountains. Remains of parts of the Canberra’s Rolls-Royce Avon jet engines and wings are still visible as well. There are excellent views at the site towards Lochnagar and the southern Cairngorms, and this site one of the most likely to be encountered by hillwalkers in Scotland, as it is so close the main path to a Munro summit. Both these sites are not far from the wreck of a Wellington bomber I visited last March and this part of the Scottish mountains has an enormous number of wreck sites, probably due to the proximity of airbases in the Second World War along the east coast of Scotland. I’m a very keen hill walker and enjoy seeing the various wreck sites in Scotland. Your site is fast becoming one of the best resources on the web and is of course bookmarked! The 10 digit GPS GR’s you give are invaluable. Thanks very much! One of the reasons I put so much effort into compiling all this information about wreck sites in the Scottish mountains was that I couldn’t find accurate and detailed resources available anywhere else, so I am building my own resource. 500m distant from each other .Was curious as to what it was so thanks for your info. I found the canbera wing while out walking recently, at the time i did not know what aircraft it was but found it interesting reading your page and finding out a little more about it. Wish i had looked around properly and found the other bits or wreckage now. Was up here on the 29th. Sept. 2012 and found that the wing had been flipped over and was now showing the RAF roundel. This was the week after the big winds across Scotland from the East. I believe the wind direction and strength was head onto the wings leading edge and for the first time since 1956 it did what an aerofoil is supposed to do and got the lift to flip it over. Interesting to see your photos of the Canberra wing, I had no idea it had such a well-preserved RAF roundel on it. It seems unlikely to me that high winds turned it over – if high winds had been able to flip it over, I’m sure it would have happened at some point before now in the half-century it’s been lying there – I believe it’s much more likely that a group of curious visitors did it. I would be interested if anyone has seen a Canberra fuselage on a munro. Back in the 70s I did a few munros and remember we found an almost complete Canberra fuselage on one but the name escapes me, I think at the time the mountain was called ‘ben a glo’ or similar but since then a lot of munros have had name-changes.